This is the second time we have held our World Taxidermy & Fish Carving Championships in Springfield, Missouri. We chose this hotel because of its central location and its accessibility. This was the location of the 2015 World Show, which was univesally well received by participants. Drive south on Airport Blvd. from the airport to Highway 266/Chestnut Expressway.Turn left and head east onChestnut Expressway, also known as Business Loop 65. Continue east until you reach Sherman Parkway and turn south on to Sherman. Sherman Parkway turns into John Q. Hammons Parkway. The hotel will be on the west side of the street at the corner of John Q. Hammons Parkway and East St. Louis Street. Exiteast on toChestnut Expressway, also known as Business Loop 65, and continueeast until you reach Sherman Parkway. Turn south onto Sherman. Sherman Parkway turns into John Q. Hammons Parkway.The hotel will be on the west side of the street at the corner of John Q. Hammons Parkway and East St. Louis Street. Exit on to Chestnut Expressway, also known as Business Loop 65. Turn west on to Chestnut Expressway and continue until you reach Sherman Parkway. Turn south onto Sherman. Sherman Parkway turns into John Q. Hammons Parkway. The hotel will be on the west side of the street at the corner of John Q. Hammons Parkway and East St. Louis Street. The new Springfield-Branson National Airport (SGF) provides nonstop service to several destinations, including: Atlanta, Chicago, Los Angeles, Dallas/Ft. Worth, Houston, and Denver. The new Branson Airport provides additional air service and is just a 40-minute drive. The Springfield, Missouri area is easy to get to, with over two-thirds of the nation’s taxidermists living within a one-day’s drive. If you live within the circle on the map, you can drive to the show in one day. We feel the venue is a perfect fit for the greatest taxidermy and fish carving exhibition on earth. When you arrive in Springfield, you may choose whether to secure your room at the two host hotels, or to go to the Springfield Expo Center to enter your competition entries and get your World Championships show packet with your badge. WTC BADGE The trade show and competition will take place in the Springfield Expo Center. Enter the front of the Expo Center and go down the escalators to the lower level. Look to your right to find a large desk marked “REGISTRATIONS”. From there you will decide whether to get in the “PREREGISTERED” line or the “NEW REGISTRATIONS” line. All fees will be paid at this desk, whether for registrations, banquet tickets, and competition entries (if you are competing). Make sure all the information is correct and that your name is spelled correctly. If you are not competing, put on your badge—you’re done! COMPETING? While in the registration lines, look to your right to find the area for entering your competition pieces. You must be wearing your badge and have all paid receipts with you when you get in this line (but not necessarily with your mount or carving entry). Each entry will be assigned a number, and you will be handed a card bearing the entry number, your name, and the species you are entering. Make sure all the information is correct and that your name is spelled correctly. Do not lose your entry cards. Finally, you can get your entry and take it into the Competition Area. There will be grooming tables set up in the prefunction area. Your piece will be photographed and then one of the staff will help you place your piece in the Competition Area. For large or very heavy entries, the loading docks off of East Trafficway Street may be used. ARE YOU AN EXHIBITOR? 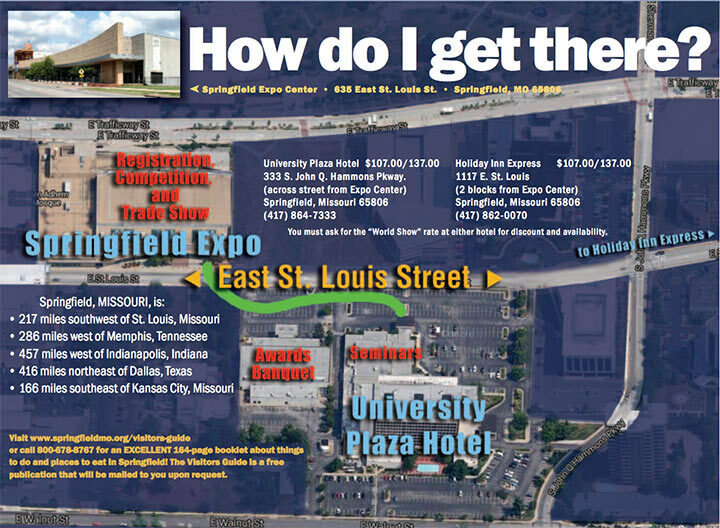 The 2019 WTC Trade Show will take place on the lower level of the Springfield Expo Center, with loading docks on East Trafficway Street. Please pick up your packet with your badge at the registration desk on the lower level of the Expo Center. You must be wearing your badge when you bring in your booth materials and set up. SEMINARS AND AWARDS BANQUET The 2019 WTC seminar program and awards banquet will take place at the University Plaza Hotel, diagonally across East St. Louis Street from the Expo Center. Click here for more info about accommodations.